General Landscape Uses: Specimen tree in residential and commercial landscapes, where there is adequate room. 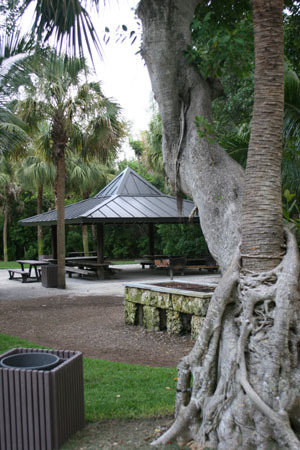 Ecological Restoration Notes: An important large canopy tree in hammocks. Availability: Widely cultivated. Available at All Native Garden Center and Plant Nursery (239-939-9663) and Indian Trails Native Nursery in Lake Worth (561-641-9488). Description: Large tree with a broadly rounded crown formed from many sturdy branches often arising from near the ground. 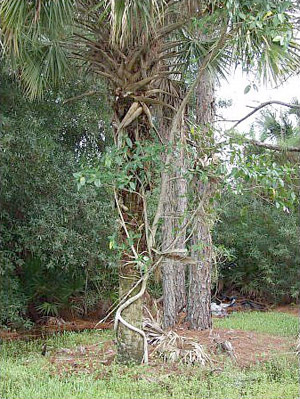 Prominent aerial roots form secondary trunks. Main trunks large, to 3 feet or more in diameter. Bark usually gray, smooth. Leaves thick and leathery, dark green above and paler beneath, usually 3-5 inches long. Semi-deciduous, the leaves turning over rapidly in the late winter or early spring. Dimensions: Typically 40-60 feet in height; to 76 feet in South Florida. Often as broad as tall. Range: Monroe County Keys north to Brevard, Osceola, Polk, Hillsborough and Pinellas counties; West Indies, southern Mexico and Central America. For a digitized image of Elbert Little's Florida range map, visit the Exploring Florida website. Habitats: Hammocks; also swamps, where it will grow semi-epiphytically on cypress (Taxodium) or cabbage palms (Sabal palmetto). Soils: Moist, well-drained to moderately well-drained sandy or limestone soils, with humusy top layer; semi-epiphytic in swamps. Fruit: Red or yellow stalkless figs, soft when ripe. All year. 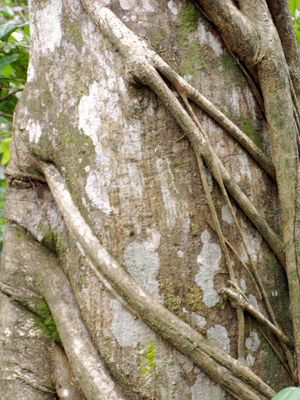 Wildlife and Ecology: Strangler fig often begins life as an epiphyte, later sending roots down into the ground. 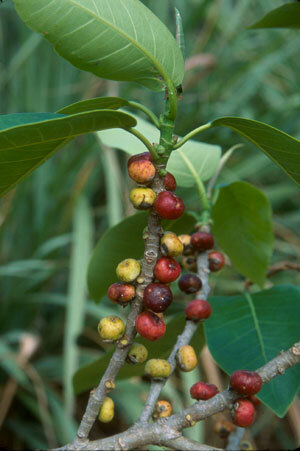 It is mostly distributed by birds, which consume the figs. It most often recruits on cabbage palm (Sabal palmetto). It provides significant food and cover for wildlife. It is the larval host plant for ruddy daggerwing (Marpesia petreus) butterflies. It is pollinated by a host-specific wasp (Pegascapus jimenezi). Fig whiteflies feed on the leaves and twigs. 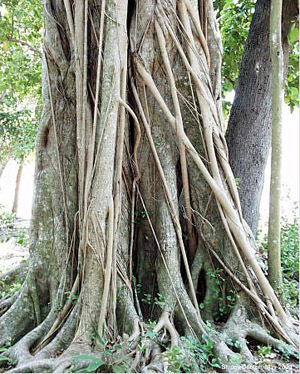 Comments: Unlike some non-native fig trees, strangler fig can withstand high winds and rarely blows over in hurricanes or tropical storms. The roots can be invasive, especially around sources of water such as septic tanks and drainfields. It readily recruits in the garden, especially in cracks in stone surfaces. 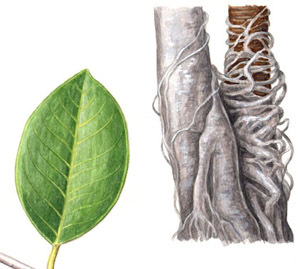 Unlike its native relative shortleaf fig (Ficus citrifolia), it has abundant aerial roots.